TH Books for Kids assisted The Predators Foundation in finding a home for over 700 books that they had stored for donation. We were able to connect them with the Monroe Carell Jr Children’s Hospital at Vanderbilt in Nashville, TN. 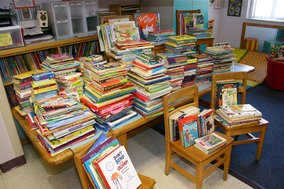 520 books were donated to the library at the Normandie Avenue Elementary School in Los Angeles, CA. 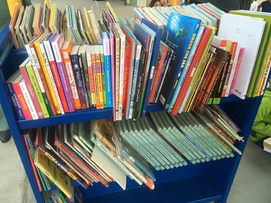 88 books were donated to Mrs. Solis's 2nd grade book cart at John F. Kennedy Elementary School in Indio, CA. 896 books and $400 were donated to Shelter from the Storm, a domestic violence shelter in Palm Desert, CA. 50 books were given as well as a monetary donation to the library of the Guardian Angel School in New York, NY that was devastated by Hurricane Sandy. Tyler auctioned an old guitar case to raise funds for Hurricane Sandy victims at the Guardian Angel School in New York, NY. Funds from this project were added to those made during the Stageit concert. Congrats and thank you to Bailey Akers. Books were donated by fans during Tyler's Hotel Cafe Residency and were kept on hand for future projects. Books were donated to Miss Vargas' 4th grade classroom at Rivera Elementary School in Pico Rivera, CA. Hundreds of books, gift cards and a $5,500 donation were made to Beyond Shelter which provides services to the homeless in Downtown Los Angeles, CA. A book donation was made to the Children's Hospital Los Angeles with the Make a Difference Network. Books were donated to the Child Life Department of the Sutter Medical Center in Sacramento, CA. A second monetary donation was made to Mary McLeod Bethune Elementary School in New Orleans, LA that was destroyed by Hurricane Katrina. A monetary donation and a donation of playground equipment were made to Mary McLeod Bethune Elementary School in New Orleans, LA that was destroyed by Hurricane Katrina. THBFK also donated a signed copy of Maniac Magee (Tyler's favorite children's book) for each student in Mrs. McSwain's 5th grade classroom. People supporting T.H. Books for Kids in various ways.